n the second round of the Americas Pacific Challenge on October 11, 2017, the USA Selects defeated Uruguay A 49-36. 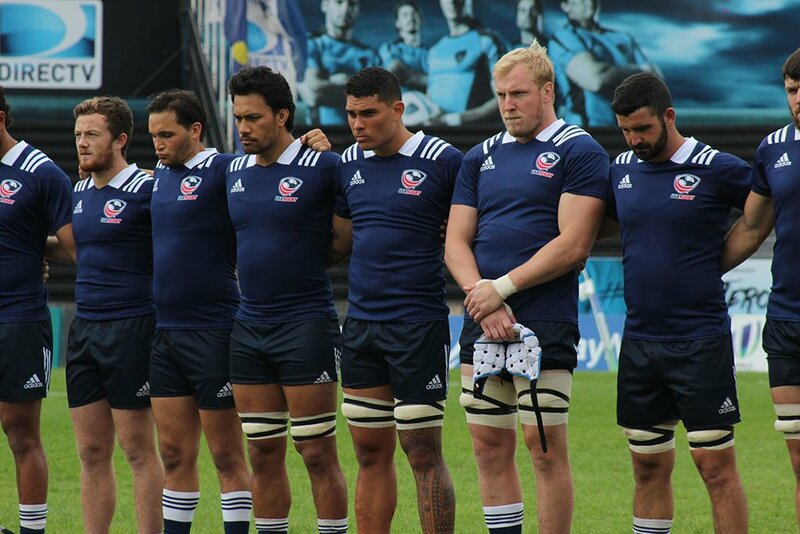 In the first round, the USA Selects were defeated by Samoa A 48-26, while Uruguay A beat Tonga A 34-25. USA Selects Play Canada A on Sunday October 11, at Estadio Charrua in Montevideo, Uruguay at 1pm ET. The match will be broadcast on The Rugby Channel and on World Rugby outside the U.S. The USA Selects had the majority of possession for the first 28 minutes of the match and put 20 points on the board from a penalty kick, three tries and a conversion. Uruguay scored a converted try from a turnover in the 29th minute and added another try with four minutes remaining to narrow the score to 20-12 at the break. JP Eloff started the scoring with a penalty kick in the 4th minutes. After almost 15 phases, Eloff cross kicked into the hands of Psalm Wooching, for an easy try in the 14th minute. The USA Selects won a scrum and Josh Whippy attacked the 9 channel and Ben Landry nearly finished just short of the line. Quick hands placed the ball in Tim Maupin’s hands on the wing and he grounded the ball in the corner for a 13-0 lead. Five minutes later, Aladdin Schirmer added a try and Eloff converted to lead 20-0. With the USA under pressure from their lineout 6 meters in defense, a loose ball was taken by Uruguay. The USA Selects were penalized and captain Guillermo Lijtenstein took a quick tap and Diego Magno received a pop pass and grounded the ball in the 29th minute. After the conversion by Joaquin Prada, the score was 20-7. Wing Gaston Mieres added a try with four minutes before the break to narrow the score to 20-12. The USA Selects lost the ball on the opening restart of the half. Uruguay attacked to within 5 meters before losing the ball forward for a USA scrum and cleared. Uruguay attacked from a lineout just outside the USA 22 meters. An offload by Joaquin Prada inside to Nicholas Freitas resulted in a try under the posts. Prada then converted to draw to within a point at 20-19. The USA Selects answered right back after several phases with Josh Whippy adding a try and a Eloff conversion to lead 27-19. The restart went to the Selects, but Huluholo Moungaloa ran into Aladdin Schirmer, with the obstruction resulting in a penalty to Uruguay. Prada slotted an easy kick to narrow the score to within a try, 27-22. The USA Selects then added two tries. The first came from a Yungert offload to Schirmer for a try under the post and an easy conversion by Eloff. The second saw runs by Landry, Whippy and Germishuys before Bryce Cambell powered his way through three defenders and offloaded to Tim Maupin for a try to lead 39-22. Uruguay cut the lead as they attacked from a scrum with split backs. Uruguay moved the ball to within 1 meter of the line and Frederico Favaro appeared to be stopped prior to the line and after a second move while on the ground reached over the line with the ball. The referee quickly awarded a try, instead of a 5 meter scrum to the USA. Favaro then converted and it was 39-29. A penalty by Uruguay for not releasing at a breakdown had vice captain Brendan Daly electing for Ben Cima to kick for points. Cima slotted the kick for a 42-29 lead. Uruguay took advantage of a penalty and a lineout 8 meters out as Nicholas Frietas added a try and Favaro converted in the 78th minute to narrow the score to within a converted try at 42-36. Cima kicked the restart inside the Uruguay 22 meters and while under pressure, a turnover was created by the USA Selects. This resulted in a try by Zach Pangelinan and a conversion by Cima as time expired for 49-36 victory. Both teams earned bonus points for match. The USA Selects evened their record to 1-1 at the Americas Pacific Challenge and will meet Canada A on Sunday October 15 at 1pm ET. Uruguay A also has a 1-1 record and will meet Argentina XV to end the Americas Pacific Challenge that day. Tonga A will play Samoa A in the first match. The USA Selects unleashed a potent offense in the win, scoring 7 tries, 2 penalty kicks and adding 4 conversions. Uruguay had 5 tries, a penalty kick and 4 conversions. The USA had the momentum for the first 28 minutes of the match, but ceded it to Uruguay for the remainder of the half. The second half had Uruguay continue its momentum after an early turnover by the USA. The teams traded scores before the USA seemingly gained control of the match. A try by Uruguay in the 78th minute had Los Teros to within a converted try of a win. The USA maintained pressure and added a try as time expired for the win. The USA Selects offense and team resolve should bode well as the USA plays their rivals Canada A in the final match on Sunday. In other second round matches, Tonga A defeated Canada A 31-15, while Argentina XV dominated Samoa A, winning 85-14. With the win, the USA Selects are in second place in the Americas Pacific Challenge standings with 6 points to Argentina XV, who have 10. Uruguay A also has 6 points. Samoa A and Tonga A have 5 points and Canada A has zero.